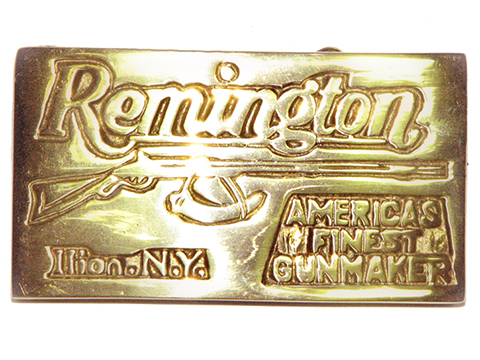 You are looking at a Solid Brass Casting Belt Buckle. This buckle appears to be a copy of an early 1900's belt buckle. It features the name Remington, a flintlock rifle and powder horn, the words "Americas Finest Gunmaker" and "Ilion.NY" It was made by Baron Buckle Co. and dates to the early 1980's.